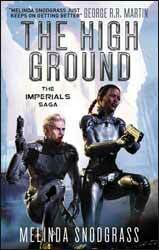 The High Ground: The Imperials Saga (2016 419 page) is the first book in a new science fiction series from Melinda Snodgrass. Set thousands of years in the future, man has spread across the galaxy and society has transformed itself to a feudal aristocracy plunging all alien races and much of humanity into second class citizens. For humans, at least, there is one way to improve your social station, win a scholarship to the military academy, The High Ground. Graduation from which elevates the candidate to the level of a military officer, a position from which great fame, fortune and power can be attained in a time of war. However, while the peace is kept, the Emperor has a problem; he has only daughters and no sons to inherit the throne. His eldest daughter, Mercedes, has been legally adopted as heir apparent, but in this society, all the first born sons of the most important families have to attend military school. In order to legitimise her ascendance to the throne Mercedes and her closest hand maidens must put the safe environment of the palace behind them to train to be soldiers. Mercedes is not the only new cadet, with many of them from important houses. There are also commoners like Tracy, the son of a tailor. The book follows their combined experiences as cadets and their growing fondness for each other. The greater majority of the book is taken up with their first year at military academy, with Mercedes growing into a stronger woman as she puts aside the niceties of the court and determines to make a go as a soldier. The book's cover is actually a bit of a misrepresentation of the majority of the plot. There is action but this is limited to the very end of the book. Most of the plot details the two main protagonists: Mercedes trying to find her new life, starting from a state of privilege and Tracy trying to survive in an atmosphere of privilege, starting from the point of a tailor’s son. It’s not a bad first novel for the series as it sets up the characters and environment well, certainly there is room here for greater exploration. But, as it stands, there is as yet nothing particularly special about the book and I do fear the lack of action will turn a lot of people off.